Why did my action plan failed? We all ask ourselves many times when implementing action plans in our company the same questions: “I did all but why it failed?”; “Why the problem occurred again? How come?” in this post I just want to give some tips on how to improve your action plans for achieving better results. The very very first thing is definition of the problem, give it a name for starting the PDCA. Set a target in this PDCA. Know where you are going, or which quicksands you are stepping into. The first question you should ask is, Did you cover all affected areas of the problem? the most important part of an action plan is the part of grasp the problem. Many people confuse the problem, effect. One of the ways I strongly recommend to grasp the problem is the IS/ISNOT Analysis. A simple way to delimitate where is the problem located, what affecting, etc.. If you are not familiar or not willing to use this method, make sure you ask all the question marks: what, where, which, how many, where, etc.. around your problem. Now comes the Root cause analysis. Ask yourself, Did you cover all possible areas of the problem ? I know this will sound obvious, but working in a team is Deffinitely the best way to approach a problem. Four eyes see much more than two, and you must always be the leader of the PDCA. Important is in the cause analysis you surround by experts and motivate them through a brainstorming. Remember in a brainstorming just take notes on every single idea, never stop or boicott the other ones ideas. Afterwards use a method on analysis/organisation of ideas like Ishikawa fishbone diagram or 5 whys. You will be surprised that in the end the root causes are more reduced that you thought. Go back and forth on problem-root cause…as much as you need until you consider necessary. For every single root cause there must be an action (at least). Make sure you put people responsible and dates. One of the reasons why some action plans fail is because people do not take responsability, just because the leader puts him/herself in the actions but they never said so. Nobody wants to make extra work, we all know. You a leader of the action plan, will have to convince people about the actions (that is why is better to be in a room together the team and convince people to accept the actions in front of the others). It is all about motivating your team, and encourage them. I promise. Be careful with root causes like “operator missed operation”. This will always happen, take it for granted that everything around operators will involve actions, but training is not the solution, go for Poka-Yoke or preventive maintenance, preventive quality, make sure machines avoid problems to happen. We are all human (this does not mean training and procedures are not mandatory). You need to be consistant in your action plan. This means that you need to think in advance how long more or less you have and how long actions will take. Be realistic or you will end up following all departments around you for nothing. Ask your team when will they promise to close action. Afterwards, you need to monitor and organize yourself to regular follow ups with your team or with the related people. Best example is an D/PFMEA, best action plan ever, always alive and regular meetings mandatory and nobody disagrees. Try to change the mentality in your organisation that PDCAs are part of the company mentality. 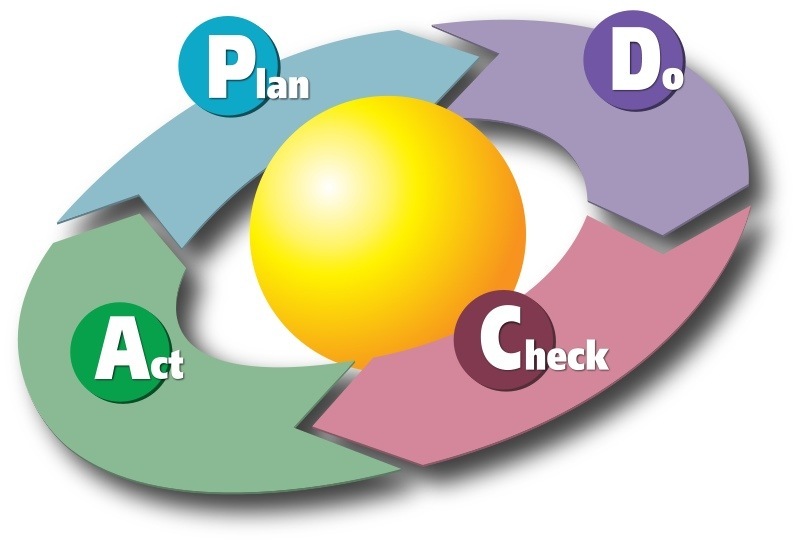 From my experience it is very difficult to keep all people in a room or telephone the day you want to review a PDCA, but make sure people give the same importance the actions than the meetings. If someone misses the follow up meeting, make the meeting no matter who is and make sure you speak with them afterwards. The point here is to make sure there are regular revisions of the implementation of the action plan. Use % of closure of actions in the same excel sheet for your own and others information (25%, 50%, 75%,100%), hide the 100% closed actions but do not delete them. Take notes on pending issues and here go back to the who makes what and when. One important point here in the Act is to validate actions with results in the production line, feedback from customer satisfaction or any other indicator (even a worst case to have feedback on recurrence of the problem). I always recommend in case of recurrence a lessons learn analysis. what went wrong? why we did not cover well the analysis. Another important point is to make sure how you keep the knowledge in your company, where do you keep technical information available, how can anyone in future from other department or division make a consultation to this action plan, have you though about it? in Quality issues, technical books are really good. Another important thing is standarisation, what can you take out of this action plan ? (i.e. can you modify operator working instructions? etc..). These things are normally part of the action plan, but you as a leader need to make sure the organisation learns from mistakes and updates documentation or whatever necessary. I always liked to close the action plans with an action, a validation visit to a supplier, review the line, make an internal audit, etc.. Make sure you use the right tools to audit your action plan. And remember always to congratulate the team !!!! ← The Key to networking on social relations: Are you helping others enough? Thanks Ramon for your point of view. The current trend in companies now is laterality work in cross functional teams and projects, learnt in the crisis.